1. What is the promotion offered for this event? - Customers who spend $1,500 on full priced products receive our gift of $300 off any purchase made between April 6th – April 21st. - Customers who spend $2,500 on full priced products receive our gift of $600 off any purchase made between April 6th – April 21st. - Customers who spend $5,000 on full priced products receive our gift of $1,250 off any purchase made between April 6th – April 21st. - Customers who spend $10,000 on full priced products receive our gift of $2,500 off any purchase made between April 6th – April 21st. 2. How will I receive my promotional discount? Your discount will be provided in the form of an exclusive promo code that we will email to the email address that is used to complete your qualifying purchase. 3. Can I use my promo code for my purchase(s) made between March 9th to March 24th? No, you will not receive your promo code until April 5th. You can apply the promo code to any purchase that you will make from April 6th – April 21st. 4. Is my promo code value based on a single transaction or my total spending from March 9th – March 24th? Your promo code value is based on a single transaction. For example, if you spend a total of $1,500 on an order made on March 9th, you will receive a promo code for $300 off. If you spend a total of $1,500 on two orders (each order totaling $750), you will not receive any promo code. 5. When will you email me my promo code? We will send out promo codes on April 5th to all customers with qualified purchases. 6. How do I know if I’m qualified to receive a promo code? If your purchase from March 9th – March 24th is eligible to receive an exclusive promo code, we will send you a confirmation email within 2 business days of your completed transaction. 7. How do I know what the value of my promo code is? In the confirmation email that we will send to you, you will see the value of your promo code. We will also identify the ID of the order that enabled you to receive the corresponding promo code. 8. What if I have two orders both qualified for receiving promo codes? You will receive two exclusive promo codes sent through two separate emails. 9. What if I use two different email addresses to place two orders and both are qualified for receiving promo codes? We will send two separate confirmation emails to those two email addresses. 10. If I didn’t subscribe to your email newsletter, am I still going to be able to receive the confirmation email and my promo code? In order to participate into the Icon Event, you will need to agree to receive our email communications. 11. If I subscribe to your newsletter with a separate email address, which one will you send my promo code to? We will send your promo code to the email address which was used to complete the qualifying transaction. 12. Can I still unsubscribe from your email communications after I receive my promo code? You can unsubscribe from our email communications at any time. 13. I know I should have received my promo code, but I didn’t. What should I do? Please call our customer service at 877-750-1171. Please have your order ID ready. 14. Can I give my promo code to my friends to use? Yes, you can transfer your promo code to any of your friends, however, each promo code can only be redeemed once. So once one of your friends uses it, it will immediately become invalid and no one else may use it. 15. What if I return part of my order before I receive my promo code? We will monitor the return of each order and the value of your promo code (the discount amount) will be adjusted accordingly. The promo code value that we email you on April 5th will be based on the final amount of your qualifying order after deducting the return amount. 16. What if I return my order after I receive my promo code? If your order is returned or becomes ineligible for receiving a promotional code, we will deactivate the promo code you have received. 17. Do I need to spend my promo code discount at once? The promo code we send to you is one-time use only. The total discount value of that promo code will be automatically deducted in its entirety from the order you will be trying to apply the promo code to. 18. What if the total amount of the order that I want to apply my promo code to is less than my promo code value? You will pay nothing out of pocket for that transaction, but the rest of the discount will not be credited or cashed out. 19. Can I still return the order in which I redeemed my promo code with? Yes. In that case, what you pay out of pocket will be 100% refunded, but the value of the promo code will not be credited or cashed out. 20. If I return an order placed between April 6th – April 21st that I have redeemed my promo code with, but I want to place another order before April 21st, can I receive a new promo code? Yes, please contact our customer service at 877-750-1171. A customer service agent will be able to issue you a new promo code as the replacement of your original one. 21. Can I use my promo code in a boutique? No. The promo code we email you can only be used for online purchases. 22. How can I redeem my promo code online? 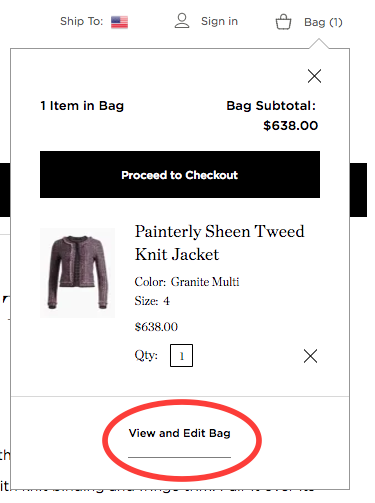 Step 1: Click “View and Edit Bag” when you move your mouse to the “Bag” icon in the upper right corner of the website. 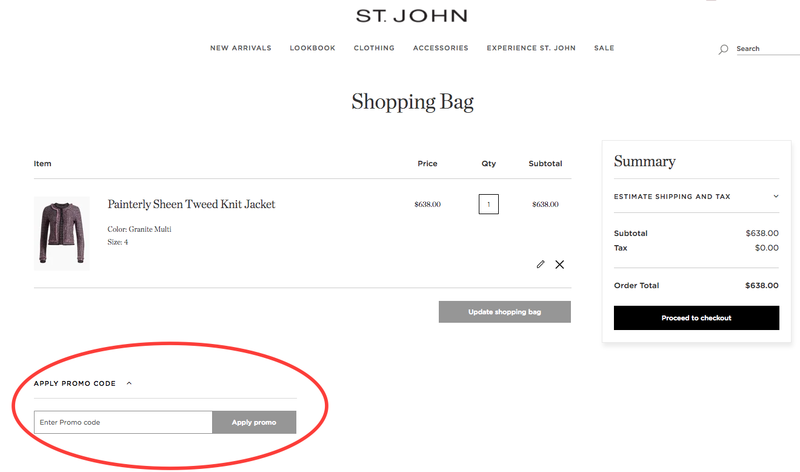 Step 2: Once you land on the Shopping Bag page and move to the bottom of the page, you will see the “Apply Promo Code” field. Place 2: Enter and redeem the promo code on the Checkout page. If you happen to miss the Shopping Bag page, don’t worry. You will be able to enter and redeem your promo code later again. 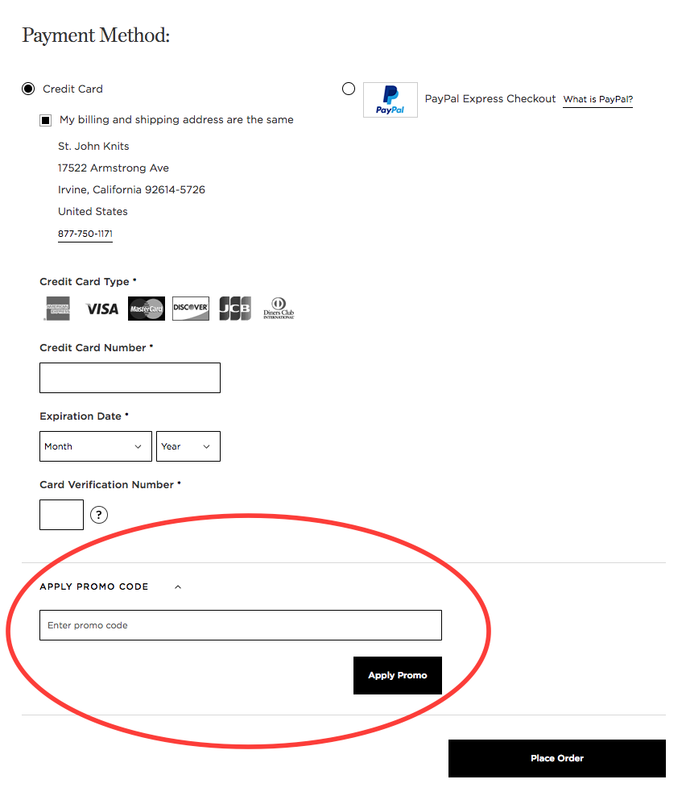 Just follow the checkout directions all the way to the “Payment Method” page, shown below, and you will be able to enter and redeem the promo code right before you click the “Place Order” button. 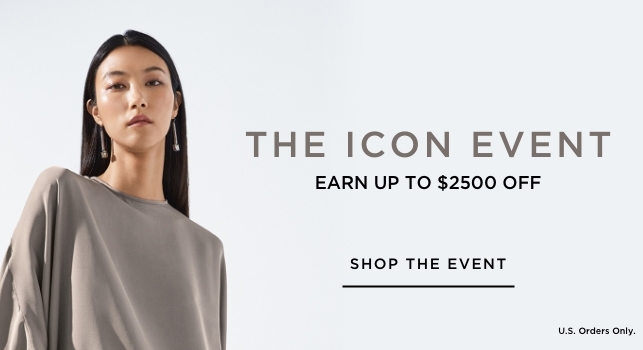 Offer valid on qualifying purchases made between March 9th, 2019 and March 24th, 2019 11:59 pm PST online at www.stjohnknits.com for U.S. orders only. This offer excludes Wolford merchandise. Some exclusions may apply. Promotional code can only be redeemed from April 6th, 2019 to April 21st, 2019 at 11:59 pm PST. Offer not redeemable in St. John boutiques, outlets, specialty retailers, or department stores. St. John employees are not eligible for this offer. Only regular-priced merchandise is eligible to meet minimum qualifying purchase. Minimum qualifying purchase amount must be met in one transaction, and does not include sales tax, discounts, shipping, delivery, alteration charges. Preorder not valid on qualifying purchase. Promotional code may not be applied to qualifying purchase. Promotional code is issued solely for loyalty, award or promotional purposes. Promotional code is forfeited if qualifying merchandise is returned. This offer cannot be combined with other offers, discounts, coupons, sales, services, or promotions. Offer cannot be used on gift cards or services. Only one promotional code may be redeemed per visit. Offer available only while supplies last. Learn more details by visiting our F.A.Q. page. The promotional code is issued solely for loyalty, award or promotional purposes and is valid from April 6th, 2019 to April 21st, 2019. This promotional code expires on April 21st 11:59 pm PST. May be redeemed online at www.stjohnknits.com. Not redeemable in St. John boutiques, outlets, specialty retailers, or department stores. Not valid on purchases made before April 6th, 2019, gift card purchases, or services. This offer cannot be combined with other offers, discounts, coupons, sales, services, promotional cards, or other promotion. Cannot be redeemed on preorder. Cannot be redeemed for cash except as required by law and cannot be applied as payment or credit to any credit card or charge account. Promotional code is forfeited if qualifying purchase merchandise is returned. Promotional code amount will be applied as a one-time merchandise discount on a single transaction; any unused portion will be forfeited at time of redemption. St. John’s return and exchange policy applies. If any merchandise that was purchased with the promotional code is returned for refund or store credit as applicable, the amount refunded or issued as a store credit will be the total purchase amount, less the merchandise discount of the promotional code. If any merchandise that was purchased with the promotional code is exchanged during the period when the code is still valid, then the merchandise discount may be applied to the exchanged product. St. John is not responsible for lost, damaged, or stolen codes. Wolford product excluded from promotional code purchases. Learn more details by visiting our F.A.Q. page.